Location : 18 kms away from the Dabolim airport and 8 kms from Vasco da Gama in Goa. Tourist Attractions : The Oberoi hotel, the Naval Aviation Museum, restaurants and the Hollant beach. Beach Activities : Fishing, swimming, windsurfing, trekking, parasailing are very popular here. Bogmalo and Majorda are broad, flat and open beaches that lie close to the port city of Vasco and are ideal for picnickers. Though popular, they are less heavily frequented among the prominent beaches of Goa. There are small clusters of beach shack restaurants and a few fishing villages scattered under the coconut palms here. 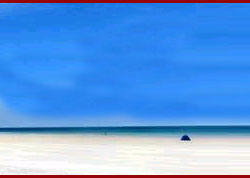 The Bogmalo beach though has the Bogmalo Oberoi hotel located on it and caters to the leisurely needs of its visitors. Shipwrecks stuck in the silt can be seen from here. The Majorda beach and the Majorda Beach Resort lie to the south of Bogmalo. The best Goan toddy can be found here, as well as the best European breads. According to the Goan version of Ramayana, Lord Rama was kidnapped as a child and brought up at Majorda. 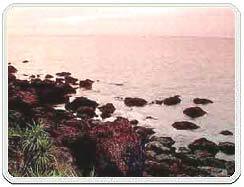 Later, in pursuit of Sita, he camped at Cabo de Rama, a headland that lies further south and where there is now a fort. A Former Fishing Village, Today's Tourist Hangout The village is still present at Bogmalo, complete with a tiny-whitewashed Chapel and gangs of hogs nosing through the rubbish, but its environs have been transformed. Pricey caf�-bars blaring Western music have crept up the beach, while the clearing below the hotel is prowled by assiduous Kashmiri handicraft vendors. Even so, compared with Calangute Or Colva, Bogmalo is still a small-scale resort. As long as one hasn't come to Goa to get away from it all or party all night, then one'll find Bogmalo congenial enough. The beach is clean and not too crowded, the water reasonably safe for swimming, and there are plenty of places to eat, drink and shop. If, on the other hand, one is looking for somewhere not yet, on the package tourist map, one'll be better off further south, at the far end of Colva Beach or beyond. A small dive school recently opened up in Bogmalo and is one of the few places in India where one can do PADI-approved Open water diving courses. Operating out of Joet's guesthouse, at the far end of the beach, the British run outift also offers half day "Try Dives" for novices, guided dives to shipwreck sites and coral beds off the coast and tuition for more advanced qualifications. Contact - Goa Diving, House No. 145P, Chapel Bhat, Chicalim, Near Bogmalo. Air : The Dabolim airport is just 18 kms away from Bogmalo beach. There is a regular bus service from the airport to the beach. Road : Buses and taxis can be taken from Vasco Da Gama, which is just 8 kms away from Bogmalo. Bikes can also be hired. All kinds of accommodation facilities are available in Bogmalo, ranging from luxurious hotels to the low budget guest houses.